I had recent urge to buy a new flashlight to add to my collection, since I recently gave one of my new lights to my daughter. I've had the 170 lumen version of the twisty Fenix E15 for a couple of years, and decided to get the just-released 2016 edition. What a fantastic little light!! Now that the head is a little bigger than the body, one could describe it as "cute", because it just looks like a baby little flashlight (but packs a TON of brightness for it's size). Upgrades from the older edition include 4 brightness modes (instead of 3), 450 lumen output on turbo mode, 16340 compatibility, improved threads, and design improvements which allow it simply to work better (twisting amounts to activate, etc). With a CR123 primary cell, it will run for 95 minutes on it's highest 450 lumen setting, and 72 hours on it's lowest 8 lumen setting. It now my favorite light by far. I suppose if I had any wishes for absolute perfection, it would be for an additional lower, moonlight mode (.5 - 1 lumen) which is great for a nightlight etc. It fits great in a pocket or on a keychain. Here's a pic of the two side-by-side. The new edition is on the right. Just thought I'd post about it and recommend it as a great EDC light. 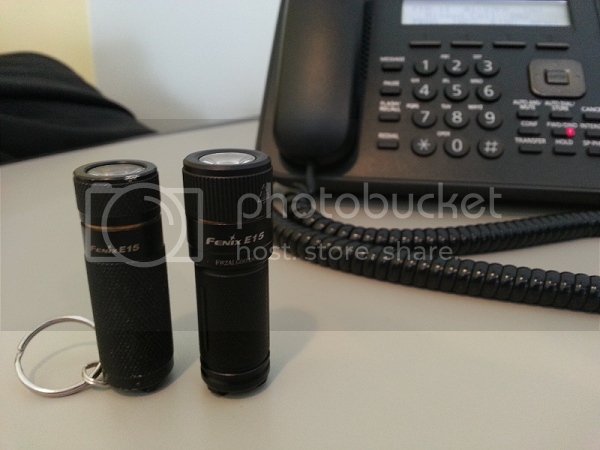 Spensive little thing though, but 450lm is a lot for a small flashlight. Have you tested run-time on full? Looks like it would get quite toasty. @Ninja Could you tell me what that Gray/Silver item is in the upper left ?